KENNEDY SPACE CENTER, FL – Tuesday evening, March 22, turned into ‘streaks galore’ on Florida’s space coast, as the nighttime launch of an Orbital ATK Cygnus cargo freighter atop an Atlas V rocket was captured in unforgettable fashion by talented space photographers as it chases down the International Space Station (ISS), loaded with hundreds of science experiments. Check out this expanding gallery of breathtaking photos and videos collected from many of my photojournalist friends and colleagues – who collectively count as the best space photographers worldwide! We all descended on the sunshine state to record the Tuesday’s blastoff of the United Launch Alliance Atlas V rocket carrying Orbital ATK’s Cygnus CRS-6 (OA-6) spacecraft from an array of locations ringing Cape Canaveral’s seaside launch pad as well as remote cameras we all set as media directly at the launch pad. The two stage ULA Atlas V lifted off right on time at 11:05 p.m. EDT from Space Launch Complex 41 on Cape Canaveral Air Force Station, Fl, into a picturesque moonlit sky on a resupply mission to the ISS. One could not have asked for better weather. Conditions were near perfect at launch time with virtually no winds and clouds. Cygnus rode to orbit on a fountain of fire. And right now she is in hot pursuit of the million pound orbiting outpost crewed by an international team of six astronauts and cosmonauts. The streak shots vividly show how the rocket magnificently illuminated the scattered thin clouds hovering over the seaside launch pad as it ascended and arced over eastwards towards Africa. The Orbital ATK Cygnus CRS-6 (OA-6) mission launched aboard an Atlas V Evolved Expendable Launch Vehicle (EELV) in the 401 configuration vehicle. This includes a 4-meter-diameter payload fairing in its longest, extra extended configuration to accommodate the Cygnus. The first stage of the Atlas V booster is powered by the RD AMROSS RD-180 engine. The Centaur upper stage was powered by the Aerojet Rocketdyne RL10C-1 engine. It was the ULA’s 62nd straight success with the Atlas V as well as the firms third launch in 2016 and the 106th launch since the company formed in 2006. 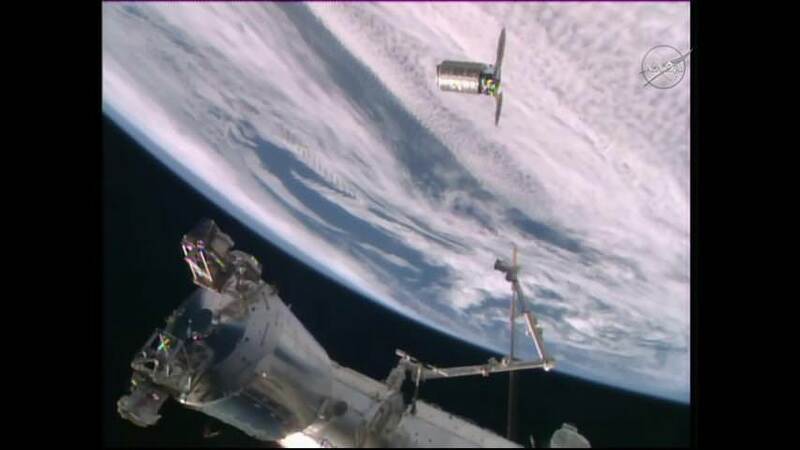 The Cygnus CRS-6 (OA-6) mission is being launched under terms of the firm’s Commercial Resupply Services (CRS) contract with NASA. It also counts as Orbital ATK’s fifth cargo delivery mission to the space station. Watch these launch videos from remote video cameras set right at the launch pad showing the full fury of liftoff sounding off with the deafening thunder of some one million pounds of liftoff thrust. Among the research highlights are experiments like Strata-1 which will evaluate how soil on airless bodies like asteroids moves about in microgravity, Gecko Gripper to test adhesives similar those found on geckos’ feet, Meteor will evaluate the chemical composition of meteors entering the Earth’s atmosphere, Saffire will purposely set a large fire inside Cygnus after it unberths from the ISS to examine how fires spread in space, and a nanosat deployer mounted externally will deploy over two dozen nanosats also after unberthing. A new 3D printer featuring significantly upgraded capabilities is also on board. The spacecraft will arrive at the station on Saturday, March 26, at which time Expedition 47 Commander Tim Kopra of NASA and Flight Engineer Tim Peake of ESA (European Space Agency) will grapple Cygnus, using the space station’s robotic arm, at approximately 6:40 a.m.